Wild: Among the carnivores on the Island that can match Tyrannosaurus in size, Spinosaurus aquareliga does not quite match its ferocity. Domesticated: Spinosaurus is an incredibly well-rounded apex carnivore. Faster than a Tyrannosaurus in water, able to travel on land unlike a Megalodon, and larger than a Carnotaurus, its all-terrain versatility may be unrivaled. 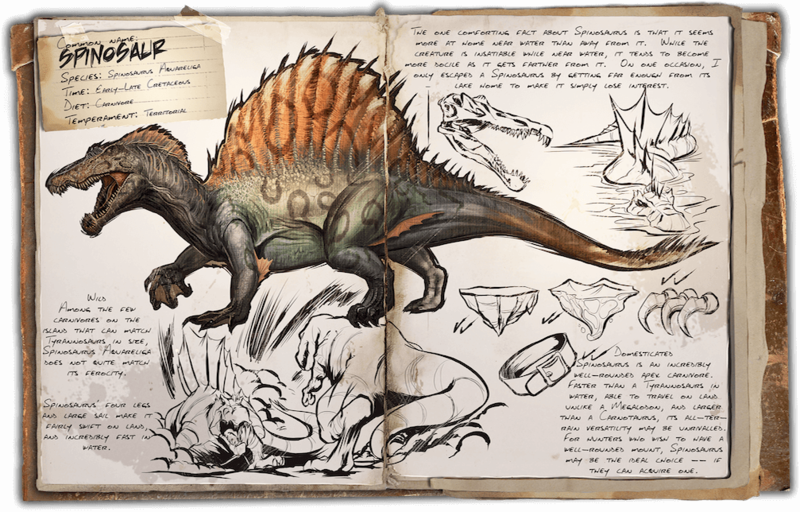 For hunters who wish to have a well-rounded mount, Spinosaurus may be the ideal choice — If they can acquire one. Known Information: Spinosaurus four legs and large sail make it fairly swift on land, and incredibly fast in water. The one comforting fact about Spinosaurus is that it seems more at home near water than away from it. While the creature is insatiable while near water, it tends to become more docile as it gets further away from it. On one occasion, I only escaped a Spinosaurus by getting far enough from its lake home to make it simply lose interest.